On Nov. 1, there appeared in Circulation, the journal of the American Heart Association, a somewhat unusual article. Unlike most reports in Circulation, which address common cardiovascular problems like heart attacks, strokes and cholesterol control, it focused on treating cardiac disease associated with Duchenne and Becker muscular dystrophy. It’s been estimated that 95 percent of boys with DMD and at least 90 percent with BMD develop cardiac involvement. And 10 percent to 15 percent of DMD-affected young men die of cardiac failure. In December, the American Academy of Pediatrics published recommendations for cardiovascular care in Duchenne and Becker muscular dystrophy in its journal, Pediatrics. The study team, led by pediatric cardiologist Linda Cripe at Cincinnati Children’s Hospital Medical Center, emphasized to doctors that cardiac issues must be given serious consideration in the care of patients with DMD and BMD and carriers of these dystrophies — very soon after the person receives a diagnosis. In the Circulation paper, researchers at various Houston medical institutions, coordinated by pediatric cardiologist Jeffrey Towbin at Baylor College of Medicine and Texas Children’s Hospital, reported their data on 62 boys with DMD and seven with BMD who had been referred from the MDA clinic in Houston to the cardiovascular clinic for evaluation, at Towbin’s request, whether or not they had any symptoms of cardiac impairment. Of the 62 boys, 31 ultimately developed heart abnormalities, seen on an echocardiogram (ultrasound imaging study of the heart). The average age at which these appeared was 15, although some children were as young as 10. Data were missing on two patients, but Towbin and his colleagues were able to report in 2005 that 27 of 29 (93 percent) of the boys showed improvement of their cardiac muscle disease (cardiomyopathy), and that the other two of the 29 showed no deterioration during the time they were studied — an average of about three years. Nineteen of the boys (16 with DMD and three with BMD) had a normal heart size, function or both at the end of the study. Unlike most children with muscular dystrophy, the Houston patients had been referred to a cardiologist before they developed symptoms of heart disease, such as shortness of breath or sweating in a cool environment. As soon as their hearts showed signs of cardiomyopathy, they were treated with a type of medication known as an angiotensin-converting enzyme (ACE) inhibitor. Those who didn’t improve in three months were given an additional medication, a beta blocker. These are the same treatments given to people with cardiomyopathy who don’t have muscular dystrophy. Both medications are designed to reduce the work that the damaged heart has to do. ACE inhibitors interrupt the actions of angiotensin, which raises blood pressure and leads to fluid retention. Beta blockers block signals from the nervous system that land on beta receptors, which increase the heart rate. Towbin was gratified at the results. Just a few years ago, he says, things were very different. When he joined the faculty at Baylor in 1989, neurologists in the Houston area were sending him patients with DMD, BMD and occasionally other muscular dystrophies for cardiac evaluations. The patients were generally 16 to 19 years old and had ominous symptoms of end-stage heart disease. Up north, at the University of Chicago, Elizabeth McNally has seen a similar evolution in care. As an adult cardiologist, she sees more people with limb-girdle, myotonic and Emery-Dreifuss MD than with DMD or BMD, but, she says, the principles are the same. “I treat cardiomyopathy with MD in the same way I treat cardiomyopathy without MD,” McNally says. “I don’t see any reason why cardiomyopathy associated with muscular dystrophy is any different, other than that you want to make sure there’s a good pulmonologist involved, which is less of an issue with other cardiomyopathy patients. McNally also prescribes ACE inhibitors, followed by beta blockers, in her MD patients. She sometimes adds other drugs, such as spironolactone, which combats fluid retention, and she’s become increasingly impressed with the positive effects of the implantable electronic devices that have become available in recent years. Among the many factors McNally has considered in treating her MD patients who have cardiac disease is the considerable overlap between MD-related and non-MD-related cardiomyopathy that molecular biology has revealed over the last several years. McNally, who has had MDA research support since 1997 to study molecular and cellular aspects of muscular dystrophy, says she’s been interested in hearts and muscles since she was an undergraduate at Barnard College in New York in 1981. Back then, she was part of a group that was studying myosins to see whether genetic flaws in these muscle proteins could cause muscular dystrophy. It turned out that they didn’t cause MD, but many genetic flaws in various myosins have since been found to cause cardiomyopathy. Other proteins can lead to either disorder. For instance, the proteins myotilin and titin, when flawed, can cause limb-girdle MD, but they’ve also been found in people with cardiomyopathy without MD. In recent years, investigations of the dystrophin gene, which, when flawed, leads to DMD or BMD, have uncovered cases of cardiomyopathy alone — with no skeletal muscle involvement — that were caused by dystrophin gene mutations. An infectious type of cardiomyopathy, in which a Coxsackie virus invades the heart, is due to the virus’s disruption of the dystrophin protein. Since 1999, scientists have found that many cases of cardiomyopathy and other cardiac problems are caused by mutations in the gene for the lamin A and lamin C proteins (it’s the same gene, known as lamin A/C). Lamin A/C mutations can cause heart disease alone or in conjunction with Emery-Dreifuss or limb-girdle MD. The take-home message was that you didn’t have to have weak skeletal muscles or even weak respiratory muscles to develop an abnormal heartbeat or cardiomyopathy. These disorders could result from a mutation in a heart muscle protein alone. The new findings began to change doctors’ views of MD-associated heart disease. Towbin’s research, in addition to showing that standard cardiomyopathy treatments help DMD and BMD patients, also suggests (though it doesn’t yet prove) that certain mutations in the dystrophin gene are more likely than others to lead to heart problems. The researchers found that mutations affecting the area of the dystrophin gene known as exons 12 and exons 14 to 17, as well as mutations in exons 31 to 42, seem to be particularly associated with heart disease. Boys with mutations in exons 51 or 52 had a lower risk of cardiac involvement with their MD. Towbin and other cardiologists are worried about the high incidence of heart disease in female carriers of X-linked forms of muscular dystrophies. X-linked MDs, which include Duchenne, Becker and one type of Emery-Dreifuss MD, are those that arise from defects in X chromosome genes. Unlike most genes, which come in pairs in both sexes and stay active throughout life, X chromosome genes come in pairs in females and exist on only one X chromosome in males. Females generally don’t get X-linked diseases, at least not in their severest forms, because their second X chromosome generally protects them from any mutations on the other X. But there’s something about X chromosome behavior that’s very different from that of other chromosomes. In each cell, only one X is active. In a process usually called X inactivation, one of the Xs is randomly inactivated. So, in a carrier of DMD, for instance, random chance may have inactivated the majority of dystrophin-producing X chromosomes, leaving muscle cells with a high number of Xs that don’t produce dystrophin. Some DMD or BMD carriers have mild to serious dystrophin deficiency and sometimes even have true muscular dystrophy. X-linked Emery-Dreifuss carriers can likewise have a lot of X chromosomes that can’t make normalemerin, a protein needed by the heart and skeletal muscles. The heart, doctors have begun to notice, is particularly hard hit in X-linked MD carriers. The reasons aren’t completely understood, but one good explanation has to do with differences in the anatomy of cardiac and skeletal muscles cells. Skeletal muscle cells are long fibers containing several nuclei. (They start out as single cells and then fuse to form the fibers.) So, if half or even fewer than half of the fiber’s nuclei make dystrophin or emerin, that’s probably enough for the skeletal muscle to function. But heart muscle cells aren’t long fibers. They’re short, with one nucleus each. If only about 50 percent of the heart’s nuclei can make dystrophin or emerin, that means some 50 percent of the heart’s cells have a missing or abnormal protein. Add to that the heart’s need for constant contraction, and you have a recipe for heart disease in a carrier. “The age of onset is much later in women than in the boys,” Towbin says, “and the progression of the disease and the severity of the disease is less than in the boys. But if you’re a carrier, you need to know whether you have it. “People get confused between the aging process and heart disease, particularly if they’re unaware of the likelihood that they would have a problem,” he says. “They can be short of breath or get fatigued when they go to the mall, or they just feel blah. Towbin and others recommend regular cardiac examinations and, if necessary, treatment, for carriers of X-linked MDs. When doctors think about heart disease in muscular dystrophy, they generally think first of cardiomyopathy, or cardiac muscle disease. If they’re experts, they may also think of dilated cardiomyopathy, the form most common in MD. Dilated cardiomyopathy describes what happens when the heart’s muscle layer, particularly in the left ventricle (lower chamber) degenerates and sags, so that it looks larger (dilated) but is weaker and less effective as a pump than a heart of normal size. The other main type of cardiomyopathy is called hypertrophic. This term describes a condition in which the muscle layer hypertrophies (gets larger), probably as a coping mechanism, but becomes so thickened that it prevents sufficient blood from entering the heart’s ventricles. But cardiomyopathy isn’t the only effect that MD can have on the heart. Some MDs, such as myotonic and Emery-Dreifuss, cause more heartbeat irregularities than they do muscle weakness, although they can cause both. The heart’s contractions, or “beats,” are regulated by electricity-like signals that move through specialized conducting tissue. The normal path for this flow is from a specific spot in the upper right chamber (right atrium) through a specific spot where the upper chambers (atria) join the lower chambers (ventricles). But in myotonic MD (in the chromosome 19 type and sometimes in the chromosome 3 type) and in EDMD (the X-linked and the lamin A/C-related form), the specialized conducting tissue is specifically affected. The result can be a conduction defect, meaning that some or all signals don’t get through from the atria to the ventricles the way they should; or an arrhythmia, meaning that the heartbeat is too fast, too slow or erratic. Elizabeth McNally sees a lot of patients with lamin disorders and heart disease. Sometimes, she says, the only difference in their outward appearance is the presence of joint contractures, which are characteristic of Emery-Dreifuss MD, in some; or an absence of contractures, which is more characteristic of LGMD, in others. Fortunately, she says, the last few years have seen the development of many new types of electronic devices, beyond standard pacemakers. Some, called PCDs, for pacing cardiac defibrillators, combine a pacemaker, which keeps the hearts up to speed, with a defibrillator, which converts a runaway fast heart rhythm down to a normal one. “We know very well that lamin mutations increase your risk of having arrhythmias, both slow and fast. So device insertion needs to be considered for those patients,” McNally says. McNally says the fine distinctions once made between conduction disturbance that comes from damaged conducting tissue and that from cardiomyopathy may not be so important, now that new devices can take care of both. Another new development is the biventricular pacemaker, a device designed to make sure the right and left ventricles are working together with a lead placed in each. This kind of cardiac therapy, called resynchronization, can be used to treat a failing pump —heart failure — that comes from cardiomyopathy or other causes. Even though the root cause of most MD-related cardiac problems is the direct effect of a lack of or an abnormality in a heart muscle protein, respiratory function plays a role in harming or helping the heart as well. These two systems are intertwined. In an environment of low oxygen and high carbon dioxide, the heart has to work harder, Towbin says. Many of his patients use noninvasive assisted ventilation, particularly at night, and he thinks that helps their hearts. McNally is also enthusiastic about treating the respiratory aspects of MD. “I’m so excited that they put out the guidelines for that,” she says, referring to guidelines for respiratory care in DMD published by the American Thoracic Society in 2004. “Supporting lung function with BiPAP [a form of noninvasive ventilation] at night for as long as possible, and choosing to be ventilated when needed, will definitely work to preserve heart function. The right [side of the] heart is not built for working against high pressures. It’s used to seeing low pressures and fairly quickly will become volume-overloaded and fail. In December, the Section on Cardiology and Cardiac Surgery of the American Academy of Pediatrics published its recommendations for cardiac care in DMD and BMD and carriers of those dystrophies in its journal, Pediatrics. A summary follows. Cardiac care of the patient with DMD or BMD should begin after confirmation of the diagnosis. The patient should be referred for evaluation to a cardiac specialist with an interest in the management of cardiac dysfunction in neuromuscular disorders. A complete cardiac evaluation should include (but not be limited to) a history and physical examination, electrocardiogram and echocardiogram. Consideration should be given to other imaging studies, such as magnetic resonance imaging (MRI). Clinicians should be aware that the typical signs and symptoms of cardiac dysfunction may not be present because of the patient’s mobility limitations. The development of dilated cardiomyopathy usually precedes the development of heart failure symptoms by years and must be identified at its earliest onset. Signs and symptoms of cardiac dysfunction should be treated. Consideration should be given to the use of diuretics (medications to increase fluid excretion), angiotensin-converting enzyme inhibitors and/or beta blockers. Abnormalities of cardiac rhythm should be promptly investigated and treated. Periodic Holter monitoring should be considered. Respiratory abnormalities contribute to cardiovascular dysfunction in DMD and BMD. Evaluation and treatment of respiratory abnormalities is recommended. Patients undergoing treatment with corticosteroids (such as prednisone) warrant increased cardiac surveillance with specific monitoring for weight gain and high blood pressure. Complete cardiac evaluation should be undertaken before scoliosis surgery or other major surgical procedures. Risks and benefits of the procedure should be discussed in detail with the patient and the family. Cardiac monitoring should be performed in DMD or BMD patients during major surgical procedures and should continue in the postoperative period. Specific anesthetic techniques and decisions about ventilation during the operation should depend on the patient and the procedure. Anticoagulation therapy (to prevent blood clots) should be considered in patients with severe cardiac dysfunction. Clinicians who are experienced in the care of patients with DMD or BMD and are knowledgeable about these diseases should be actively involved when patients are treated in an intensive care setting. 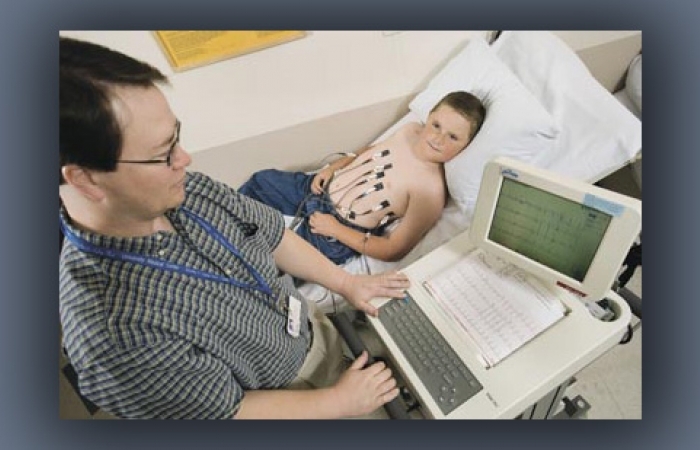 Patients should be routinely managed in early childhood with a complete cardiac evaluation at least every other year. Yearly complete cardiac evaluations should begin around 10 years of age or at the onset of cardiac signs and symptoms. Complete cardiac evaluations should begin around 10 years of age or at the onset of signs and symptoms. Evaluations should continue at least every other year. Carriers of DMD or BMD should be made aware of the risk of developing cardiomyopathy and educated about the signs and symptoms of heart failure. Carriers of DMD or BMD should be referred to a cardiac specialist with experience in the treatment of heart failure and/or neuromuscular disorders. Patients should undergo initial complete cardiac evaluation in late adolescence or early adulthood or at the onset of cardiac signs and symptoms, if these signs or symptoms appear earlier. Carriers should be screened with a complete cardiac evaluation at a minimum of every five years starting at 25 to 30 years of age. Treatment of cardiac disease is similar to that outlined for boys with DMD or BMD.